This page will take a few seconds to load as it is graphics intensive. What do you need to take a wither tracing ? 1. A sheet of paper at least the size of legal typing paper and a flat surface to lay it on. 3. A flexible curve. This is essentially a piece of solder wire covered in rubber and is approximately 2’ long. It can be purchased in the drafting section of Staples. 4. Someone to assist keeping the horse square and straight. Where do you take the tracing ? The wither tracing should be taken under the points of the saddle tree or approximately 2.5”-3” behind the back edge of the horse's scapula (shoulder blade). The points are the right and left side of the pommel that run parallel to the sides of the horse's withers. 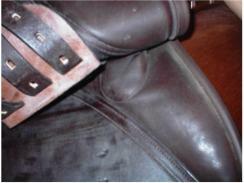 The points of the tree can be located by lifting the leg flap and looking at the top front of the sweat flap, just below the front of the stirrup bar. There you will typically see a half circle of stitching. These are the point pockets in which the points of the saddle tree rest. Positioning the saddle correctly allows the scapula to rotate/ slide several inches without interference or injury from the tree. 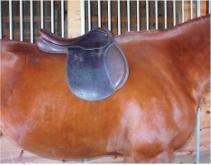 The best technique for positioning the saddle is to push it down and back until it stops at a spot dictated by the horse's conformation. Typically people stop pushing before the saddle stops sliding. 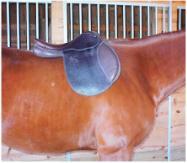 This results in the saddle being still too far forward on the horse's withers. 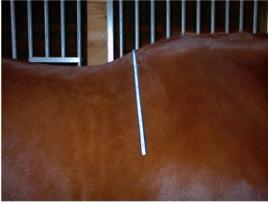 Once the saddle is in the correct position, find the points and place your finger or a mark under the points. Assuming the points are approximately 2.5”-3” behind the back edge of the horse's scapula, this is where your tracing will be taken. If the saddle you are using has forward points, as many of the older jumping saddles do, do not use it to determine point position. Simply find a spot 2.5”-3” behind the scapula. Fold the flexible curve and place the center over the spine. At this point the horse must be standing square with his head and neck straight forward. 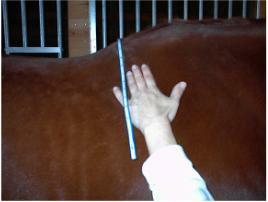 Press the curve into the sides of the withers until it conforms to the horse's shape. Carefully remove the curve and place it on the paper. Trace the inside edge of the curve. Indicate off side and near side of the tracing. Additional tracings may be taken of the topline and across the back at T-16 (approx. 3” in front of the vertrebra that corresponds with the last rib). 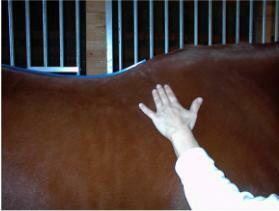 The topline tracing should start at the same position as the points of the tree. ©2013 Master Saddlers Association. All rights reserved.